A Mi’kmaq group has bought the land outside Sackville where 13 Radio Canada International towers stood for decades, CBC-Radio Canada confirmed Friday. Five years after the Tantramar Marsh site was put up for sale, the New Brunswick non-profit Mi’gmawe’l Tplu’taqnn bought it for an undisclosed price. “This transaction closes the book on an interesting chapter for CBC/Radio-Canada and Canadian broadcasting in the world of international shortwave broadcasting,” CBC’s Martin Marcotte wrote in an email. 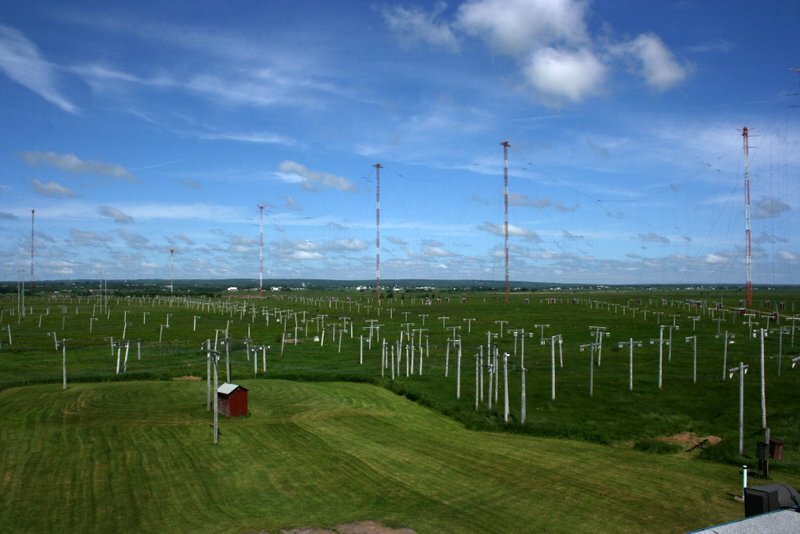 The shortwave service ran for 67 years, and the site’s towers facilitated the service around the world until budget cuts in 2012. The 90-hectare property was initially listed with the towers, to avoid the high cost of dismantling the facility, but in 2014, CBC began dismantling the towers in hopes the blank slate would entice more buyers. Click here to read the article on CBC News. This entry was posted in Broadcasters, International Broadcasting, News, Shortwave Radio and tagged Mi'kmaq, Radio Canada International, rci sackville, RCI Sackville Closure on February 3, 2017 by Thomas. Documentary filmmaker, Amanda Dawn Christie, has been gathering footage to create Spectres of Shortwave: a 90 minute documentary film focusing on the Radio Canada International Sackville transmitting site. Little did Christie know when she started shooting the film several years ago that the site would not only be be shut down but dismantled. Click here to continue reading and to watch Christie’s footage on Vimeo. It’s with a heavy heart that I watch these majestic towers fall. After all, I’ve been pretty vocal about how foolish I think Canada is for destroying Sackville. Still, I’m glad someone is documenting it properly. Click here to follow Spectres of Shortwave on Facebook, set to be released later this year (2014). I’ll certainly post updates about the film here. This entry was posted in Art, Broadcasters, International Broadcasting, News, Shortwave Radio and tagged Amanda Dawn Christie, Radio Canada International Sackville New Brunswick, RCI, rci sackville, RCI Sackville Closure, RCI Sackville movie documentary, Spectres of Shortwave on March 20, 2014 by Thomas.